Bogor Soil Museum occupied a room on the ground floor which was relatively small in a building at the rear end of the Soil Research Office complex located at Jl. Ir H. Juanda No. 98, Bogor. The entrance to the building complex where the museum located is opposite to the location of Bogor Zoological Museum. Bogor Soil Museum was established on September 29, 1988, and is a place where the type of soil samples from all important areas in Indonesia are on display in small sizes in the form of macromonolith. In the museum there are also samples of a variety of rocks, fertilizers, soil testing devices, maps, mockups, and land surveying toosl. Unfortunately when I visited the museum, the person who knows a lot about all the collections that were stored in the Bogor Soil museum was not available. According to an employee, that person was at a meeting somewhere in Jakarta. Luckily there was other person who kept the museum key and opened the door for me so I could get into the museum. 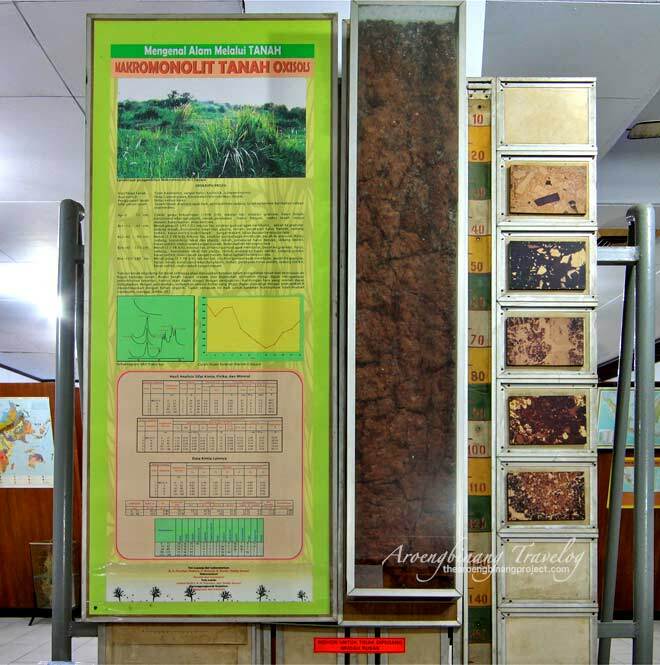 One of the displays in Bogor Soil Museum that shows the process of the making of Macromonolith when it was done in the field. Macromonolith is a vertical slice of the cross section of undisturbed soil sample and then preserved as research material and documentation. Macromonolith is usually made with a standard size of 150 x 25 x 4 cm. The room of Bogor Soil Museum was elongated shape without partition and looked simple, with most collections sticked to the walls, and partly filled the center of the room. I walked around alone in this room while observing a number of collections that I saw for the first time. The museum collections are really very specific ones. 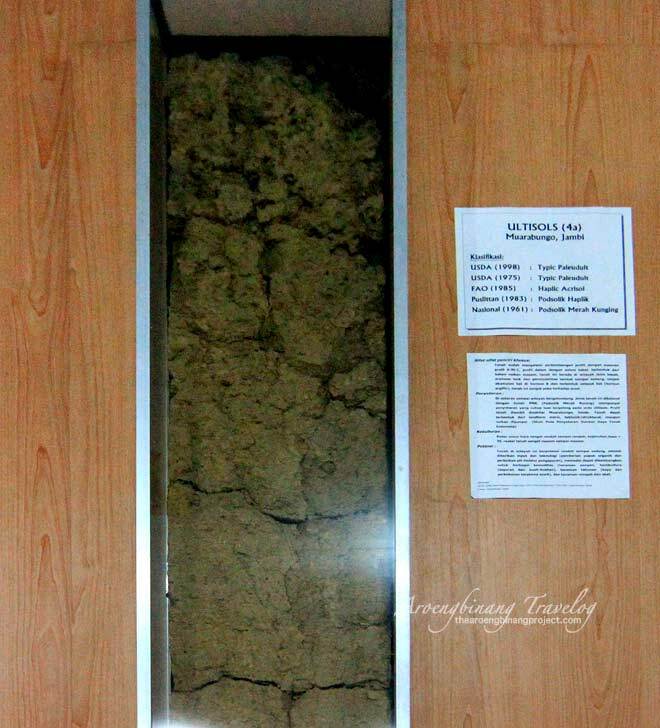 One of the Bogor Soil museum collections in the form of soil macromonolith originating from a location in the village of Pagak, Ngombol District, Purworejo Regency, Central Java. Detailed technical information is presented in the poster, and there are also photos when sampling was done at the site. At the bottom of the poster is technical information in English. Nearby there were also collections of soil macromonolith, the samples were taken after the severe tsunami calamity that hit Aceh in December 2004. 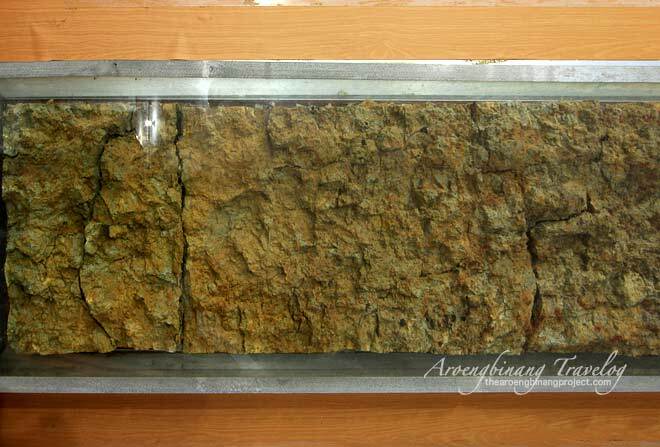 The macromonolith stored in Bogor Soil Museum was taken in 2005, or less than a year after the disaster. There are also macromonolith taken from Tulungagung and Ngawi, both in East Java. 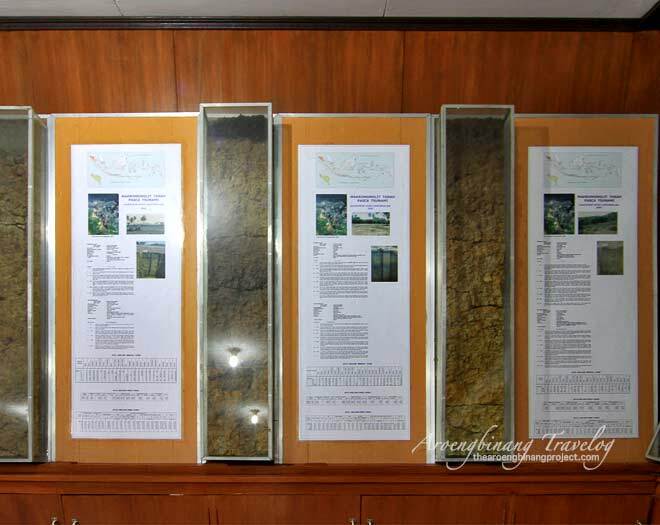 Samples of Ultisol in Bogor Soil Museum. The samples were taken from an area in Muarabungo, Jambi Province, Sumatera. Ultisol is a type of soil found in the area with average soil temperature of more than 8°C. They are found in the area of dry land in Sumatra, Kalimantan, Sulawesi and Irian Jaya, which had not been used for farming. The word of "ultisol" comes from the word of "ultimate" or final, because ultisol viewed as the end product of weathering minerals that continues over time. Ultisol generally does not contain lime, with the weathered mineral content of less than 10% at the top layer of the extreme soil with a low base saturation. 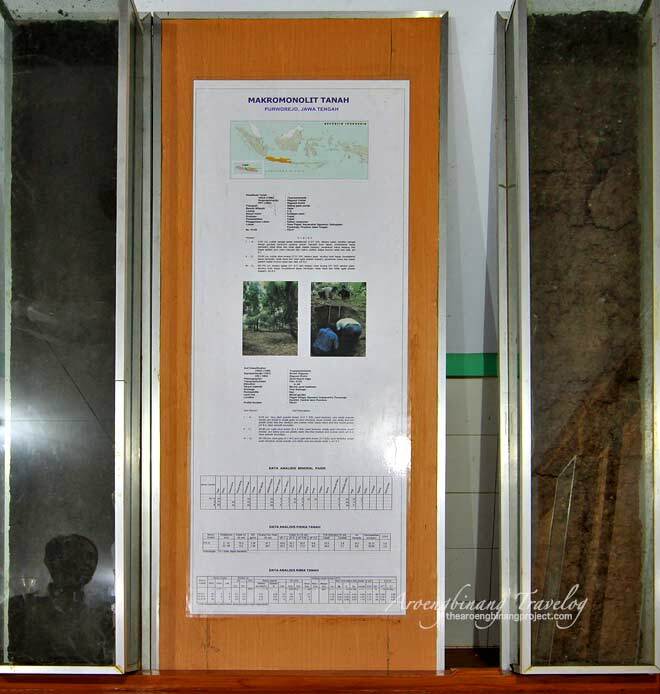 Documentation of field research on the characteristics of soil in several places in the country are on display in Bogor Soil Museum. In the documentation, among others, presented notes on soil classification, physiography, topography / slope, the main material, drainage, permeability data, land use, and the locations where the research and data collection were done. Bogor Soil Museum collection in the form of inceptisols, where the samples were taken from Sikijangmati, Pelalawan Regency, Riau Province, Sumatera. Inceptisols are kind of young soil with very low nutrient levels. This soil type is generally can only be planted with good results after being treated with organic fertilizer and conducting pH adjustment. In the hall of Bogor Soil Museum, adjacent to the Inceptisol samples, there's a rather short shelf with rows of plastic containers which were used as storage of single and multiple inorganic fertilizer compounds. Different soil conditions require different fertilizer and different processing methods for plants to flourish. The Bogor Soil Museum which although its physical appearance is not so interesting, but it could certainly be a major contribution to the documentation of the research and development of land in Indonesia. In turn it would be very beneficial to the advancement of agricultural production and plantation communities in various places in the country. Label : Bogor, Museum, Travel, West Java.